A new Which? report has called for the next government to radically re-think its energy efficiency strategy to help millions of consumers ensure their homes are better insulated. 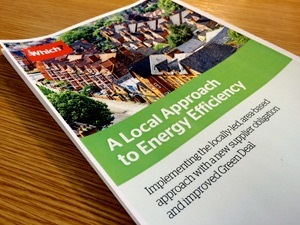 With energy bills consistently one of the top financial worries for consumers, the new report, ‘A Local Approach to Energy Efficiency’, calls for a better approach to energy efficiency. Despite successive governments attempting to address this issue, the UK’s housing stock continues to be among Europe’s least energy efficient with millions of homes leaking cash every winter through poor insulation. Up to 5.4 million homes still do not have their cavity walls filled, a measure which can save up to £140 per year off the average dual fuel bill, and up to 7.4 million still need their lofts fully lagged. It is also estimated that the NHS spends £1.36 billion each year treating illnesses caused and exacerbated by cold homes. A switch to a long-term local approach: partly funded by a long-term levy on energy suppliers and paid into a central pot. Funds would be allocated by a central administrator to local authorities for them to lead the roll-out of energy saving measures from 2017. This could include partnerships, for example between councils and GPs or social landlords, to use local knowledge to maximise consumer take up. An overhaul of the Green Deal: With just 399 plans taken out on average each month since it launched – around 9,600 in total – Which? wants to see fundamental improvements and an immediate evaluation of the scheme. A decade-long cross-government plan: Which? wants to see clear insulation targets and delivery plans extending over the next ten years. Taking action on energy efficiency needs a joined up approach across government including Department of Energy & Climate Change, Department for Communities and Local Government, HM Treasury, Department of Health, Department for Business, Innovation & Skills and devolved administrations, because of the many benefits for health, jobs and the economy. Better cost control and value for money: Which? wants to see greater scrutiny and oversight of the money spent from consumers’ bills on energy efficiency. Which? wants to change the supplier obligation to a fixed levy on bills, overseen by government, which would ensure more transparency and certainty about the costs consumers pay for green measures. “With millions of homes still not insulated, energy efficiency is a collective failure of successive governments. The next government must grab this issue by the scruff of the neck and commit to an aggressive energy efficiency strategy as soon as it takes power. “We want to see radical improvements to the roll out, funding and take-up of energy efficiency measures so people can enjoy warmer homes, lower bills and better health. Tagged with: Department for Business, Department for Communities and Local Government, Department of Energy & Climate Change, Department of Health, Energy Efficiency, government, HM Treasury, Innovation & Skills, report, Richard Lloyd, Which?